This article on the 19th (Queen Alexandra’s Own Royal) Hussars during the First World War will provide you with an overview of the Regiment’s activities during the First World War. It will also explain what records are available if you are researching a soldier who served with the 19th Hussars during the war. In April 1915, the squadrons were reunited and the Regiment joined the 9th Cavalry Brigade, 1st Cavalry Division on 14 April 1915. The 19th Hussars served with this formation for the remainder of the war on the Western Front. The best resources if you’d like to learn more about the Regiment is its war diary from April 1915 onwards which I have discussed below. I would recommend downloading the main 19th Hussars’ war diary which I have discussed below. Officers: An officer’s service record, if one has survived, is the most important document to find. It will either be at the National Archives (I offer a copying service) or if they served past April 1922, it should still be held by the Ministry of Defence. I have written a guide to ordering these files on my Second World War website: Ordering a Service Record from the MOD. The Regiment’s war diaries frequently mentions officers by name and includes nominal rolls of officers serving with the 19th Hussars on certain dates. When it comes to searching for officer’s promotion dates, have a look in the London Gazette and Hart’s Army List (pre-war). Newspapers are a good resource to use when trying to find a photograph of an officer or for information regarding a casualty. Other Ranks: A service record is the most important document to find, though a large percentage were destroyed in the Blitz. 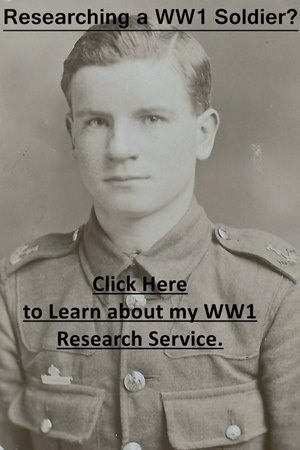 If a soldier served past January 1921 then their service record should still be with the Ministry of Defence and I have a guide on my Second World War website: Ordering a Service Record from the MOD. You can often work out when a soldier joined the 19th Hussars from their regimental number. 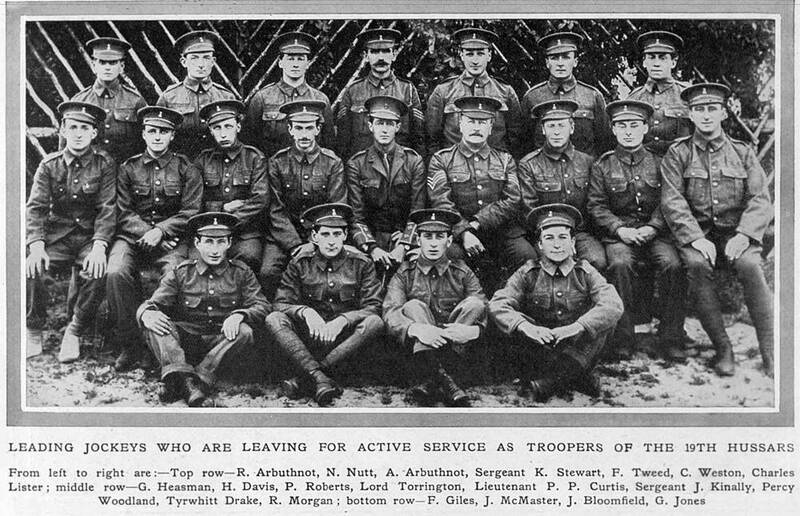 A photograph showing jockeys who were serving with the 19th Hussars taken from The Tatler, 16 September 1914. You would not usually expect to see named photographs of other ranks in Tatler! To research either an officer or other rank who served in the 19th Hussars during the war, you’re going to have to look at the records on both FindmyPast and Ancestry. Both sites offer a free trial and if you live in Britain, you can often access them at your local library. Clicking on the banner below will take you to FindmyPast. There are five war diaries for the 19th Hussars and all can be downloaded for a small fee from the National Archives’ website by clicking on the blue links below. I have transcribed a couple of months from B Squadron’s war diary below. Notes: A short war diary consisting of only four pages. Notes: An average war diary which gives an overview of the activities of A Squadron, 19th Hussars. There are no appendices and most of the entries are brief. This war diary has been digitized and is available to download from the National Archives’ website. Notes: An average war diary, though there are more detailed entries between October and November 1914. Notes: A poor war diary with few entries. The entry for November 1914 consists of “This Squadron has done nothing during the month of November” and there is a similar entry for December 1914 and January 1915. Notes: This is the main war diary of the 19th Hussars which covers the Regiment from when it reformed to March 1919. Overall a very good war diary due to the variety of appendices including operational orders and officer nominal rolls which have survived. This war diary is nearly 600 pages in length. Unfortunately, there was no regimental history published for the 19th Hussars covering the First World War. 3 January 1915: No change. 2/Lt W. F. Tuthill and one man left for Rouen to join cavalry details. 7 January 1915: Three men transferred to machine gun section attached to 16th Lancers. 10 January 1915: Eight NCOs and men joined from cavalry details Rouen. 17 January 1915: 17 NCOs and men joined from cavalry details Rouen. 22 January 1915: Corporal Leperrier (Interpreter) joined. 26 January 1915: Traffic control duties handed over to 4th Divisional Cyclist Company. 30 January 1915: Corporal Leperrier left for St. Omer. During this month a miniature range was constructed and progress made in refreshing reservists in musketry. Training in riding, dismounted action and patrolling also carried out. On Wednesdays every man on parade. Weather cold with alternating freezing and thawing. A little snow fell during the night. Nearly all horses under cover and doing well. Horses fed on “brewer’s grains” twice a week with beneficial results. Short periods of furlough to NCOs proceeded with. 2 February 1915: Five men transferred to “A” Squadron 19th Hussars in exchange for five B Squadron Men. 5 February 1915: The squadron ordered to furnish a working party of one officer and 25 other ranks daily for the purpose of assisting the Royal Engineers to construct reserve and support trenches and various other field works near Le Touquet. Two troops detailed alternate mornings (9 am to 1 pm) and afternoons (2 pm to 6 pm) for this duty except on Wednesdays and Saturdays, when squadron was exercised in dismounted action, etc. Working party shelled occasionally, no casualties. 9 February 1915: Visit of D.D.R., 2nd Army, who reported horses in excellent condition. All horses, except transport under cover: clipping trace high proceeded with. 21 February 1915: Lieutenant-Colonel Jamieson Commanding Canadian Divisional Mounted Troops attached from 21 February 1915 to 27 February 1915. 23 February 1915: Three chargers arrived from Base. 24 February 1915: Ten other ranks with four horses arrived from Base. NCOs proceeded on short periods of furlough to England.